Every time I meet a new member of the Corvidae Family I am smitten. Jays, as a group, are smart resourceful and delightful when you have an opportunity to watch their behavior. The Gray Jay is even more amazing because of where it lives--in the boreal and subalpine coniferous forests of North America. It is a year round resident in these unforgiving extreme winter environments! Several adapative qualities have helped this jay thrive in this environment, including its thick, fluffy plumage and its hoarding behavior. Gray Jays begin cacheing food--berries, arthropods and mushrooms--in late summer and continue as winter arrives. They coat the food with copious amounts of sticky saliva and hide it under bark or lichen and in the crevices of trees, sometimes covering it with another piece of bark or lichen. This food helps sustain the birds through the winter and into their breeding season which begins before winter ends! 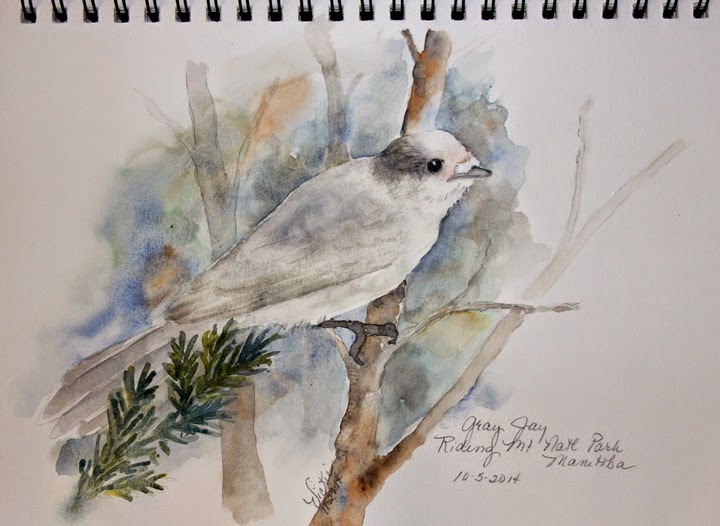 For more information, visit my blog post at Vickie Henderson Art: Gray Jays: Bold, Smart, Resourceful! Nice grey Jay, Vickie! I've actually observed a grey jay sticking food onto a limb with its 'sticky spit.' At the time I was unfamiliar with the behavior and was simply amazed. Cool observation! I've only had a couple of chances to observe these birds and always with a group. It was fun to watch their hunting style. Thank you, Cathy! I subscribe to Birds of North America Online. When I see a species I'm not familiar with, I come back home and read more about it. This is an amazing bird! This bird is rendered so beautifully. I've never seen one myself but your study makes me feel like I have observed it through your eyes.